Are you spending tons of dollars on your BuySellAds (BSA) banner ad campaign and still not getting the results your desire? Is your CTR (Click through Rate) grounded and it seems no one is interested in your banner offers? Well, you're right on the spot to learn some of the insights that would help you boost up your banner CTR and get rewarded with profitable leads. BloggingeHow is generally at publishing end for BuySellAds and we keep a keen eye on our advertisers results. We get a decent amount of advertisers and each and every one of them have a unique approach towards design their banners. Many perform pretty well and know exactly what to target and some fail drastically and wasting up their money. Here at BeH, we have previously published a lot of guides, though all of them being on the publishing end and helping publishers improve their earnings via BSA. Though, its time to help people like you to make use of the tricks we have learned from our advertisers results. Below, I've compiled a list of tasks that i believe would work for you and have been tested on our advertisers at BloggingeHow. Make sure you go through all of them as they have a huge impact on your banner campaign. It would be a BIG disaster for you if you go ahead and totally miss out your niche while choosing publishers to advertise upon. And thats pretty much obvious. You would want technology users to know more about Apple's new product rather than an audience that is interested in animal foods. Simply go through all the niches that are close to your company or aims in BuySellAds marketplace and choose only 1! You should be focused enough to choose only and only one niche. Once you know your targeted niche, you should be clear about the range of your budget that you can spend on your BuySellAds ad campaign. Sometimes people are not sure about it and you can go about it in a way that simply set the lowest amount that you can manage to giveaway first for testing purposes. Say you set 100$. Now you need to save these precious 100$ in a way that you get the most out of them in a single go. Once you start getting results and profit, you can gradually increase your budget and move on to the popular websites/publishers to target more results. Now here is all what matters. In BuySellAds, taking example of Finance and Business niche, you would find tons of publishers though most of them could be rubbish for your Ad Campaign. 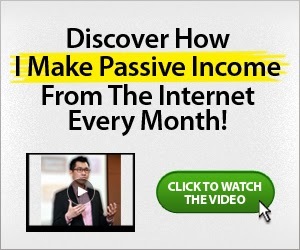 "Discover How i Make Passive Income Online"
You create an Ad Banner as below and hope that it would convert. For this matter, the most targeted niche in BSA marketplace is Finance and Marketing. Once you're in there, there are a whole bunch of publishers, though trust me, not even 20% of them are what you're looking for. 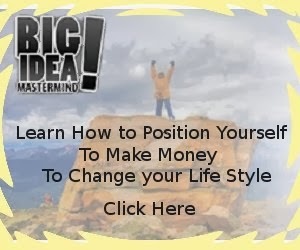 Now, on the first thought, we know that every body wants to make money online. Though you got to see which publishers basically guides the audience through that path way. That's what you're looking for. Even though though, theNextWeb.com has a massive traffic, though its of no use to you for this example. People there are mostly in search for Tech related content and your banner would fail horribly. The best practice is to visit the blog/website and judge the audience via comment section, blog's about page and types of articles it posts. Also, you can judge through blog's title tags and meta description of what niche they target. Another great approach is to judged blog's via their popular content. That could tell you what readers are interested in at that web space and what content Google is promoting on their site. These few points would help you to better focus on choosing your right publisher. Next up is to make a highly converting Ad banner. There is no hard and fast rule to what sort of banner would work for you. You got to test out different banners though you could always achieve a highly converting banner by by passing mistakes that other people have already made. The more keep observer you are, the higher your chances are to succeed. Always go ahead with the standard Ad formats for online advertising industry. Here is a post for you (though through publishers prospective) that would help you know the right ad formats. Top 8 Spots To Display/Show BuySellAds BSA Ad Banners? Generally, Clean and Clear Ad banners where the keyword line is visible clearly perform the best. Also, while designing your banners, its better to judge other banners already live on the publisher you target and make a unique one. Generally, banners with simple fonts and coloring work the best. Avoid using bold colors like RED etc. It pinches the readers eyes and would push them further from the banner. A call to action is almost a MUST. May that be "Click to Know" or "Watch this Video", "Click Here", "Download this or that". 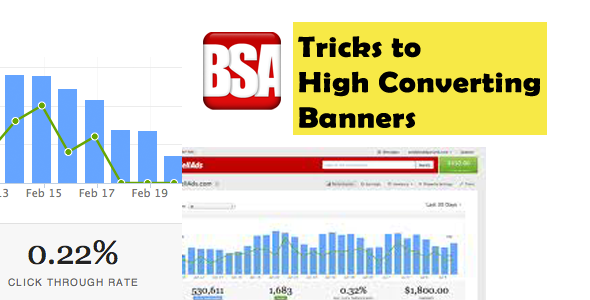 Below are few examples of High Converting Banners on BloggingeHow. This is to help you out to study what is common in them so that you could too incorporate into your own. Generally, banners above the fold provide the highest CTR, THOUGH having said that, i don't believe in that once that i have studied BloggingeHow's advertiser's campaigns. Its all about link between your offer and state of mind of the reader. If your reader is in the middle of reading some juicy content, he might not want to click away from the page. Sometimes, banners just below the post ends works perfect. What banner placement i would prefer? If was acting like an advertiser, i would have targeted above the fold area with majorly sidebar ads. Sidebar ads if well designed convert the best as reader is into reading the content and when he/she goes across similar ad, they are more likely to convert. Its sometimes funny how advertisers let go a premium ad spot by miss reading their Ad banner data. Sometimes a higher CTR and more readers towards your email list, targeted campaign would not mean that they would convert into a sale or a helpful member of your campaign. We've had advertisers that are pretty happy with low CTR of around 0.1% and some are even not satisfied with 0.6% that they get. This can either be because of their high expectations or their leads aren't converting. You can't judge what your CTR should be in a certain niche with out jumping into it. You got to test few banners (1-5) and that would give you an idea of what to expect. Then, you can fine tune your banners to get the most out of your Ad banners. I hope that this short guide was helpful for you and gave some of the insights of Banner CTR and conversions from advertisers prospective. Do let me know if i have missed something and has worked for you. BloggingeHow | Making Blogging Simpler: 7 Tricks to Increase CTR of BuySellAds Banner Campaign - Are you Missing These?